If you’re regularly monitoring your email engagement metrics, you may notice that a segment of your email list never opens your emails. 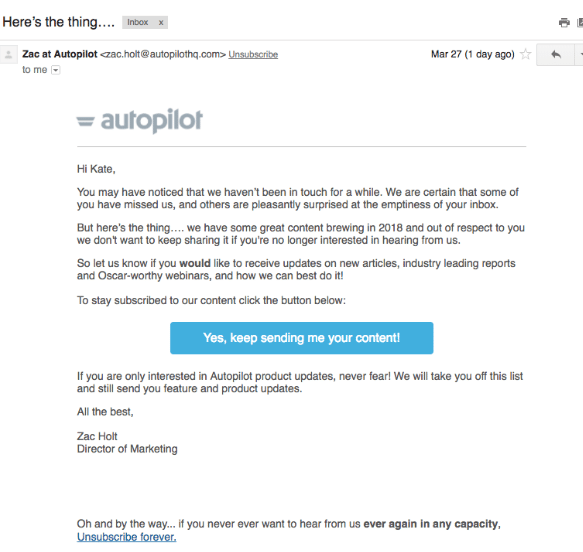 It can be frustrating, but it’s a reality for even the most engaged email lists. If a recipient doesn’t open your emails, it doesn’t necessarily mean that they view you as spam. It may be as simple that you just that may have caught them at a bad time or, in more concerning situations, that they don’t perceive value from opening your email. Regardless of the reason, you will need to remove unengaged users from your list to help your engagement rates and sender reputation. But there’s something you can try before you say goodbye forever—the re-engagement email campaign. What Is A Re-Engagement Email Campaign? A re-engagement email has one purpose and includes only one call to action or ask: do you still want to get our emails? Also known as a win-back or we miss you campaign, this email serves as the last touch point with a user before you remove them from your email list. The following tips and examples will help you pull together a re-engagement email quickly, effectively, and gracefully. There’s so many ways to segment your email list, but when it comes to segmenting for a re-engagement, you can keep this one fairly simple. Segment your email list between engaged recipients and those who haven’t opened one of your emails in a certain amount of time—ideally around one to two months. The criteria for what “engaged” means may differ depending on your industry and email programs. Check out some industry email benchmark metrics in our 2018 Global Benchmark Report for comparison. Doing this work up front allows you to focus your efforts on developing new content for people who are highly engaged, while also checking in with your less engaged recipients with targeted and poignant content. When reaching out to inactive readers and asking them if you’re bugging them too much, the last thing you want to do is come off as defensive. Keep the email copy friendly and humble throughout. But at the same time, keep it succinct and to the point. Humor may play in your favor, but keep in mind that everyone has different senses of humor, and you don’t want to offend people either. A/B testing is a great way to see how these approaches work for you. Convincing people who don’t open your emails to open a re-engagement email isn’t’ going to be easy. You have to make them do a double take, and the subject line is where you can make this happen. If your subject lines tend to follow the same format after each send, try mixing it up so that the recipient instantly recognize that this email is different from others. Proper Cloth, a men’s clothing line takes advantage of the subject line by providing an intriguing and click-worthy email, which happens to be the headline as well: Is this the end? Notice that Proper Cloth defaults to removing all recipients on this send from their email list. But in addition to giving their recipients the chance to change their mind, they also provide them with an additional option to reduce their email frequency to once a month. This strategy is great because it will keep the recipients who are most likely to engage in the future while also clearing their list of inactive and uninterested users. Their email subject line above is clear, concise, and just the right amount of cheeky. If the recipient wants to remain on your email list, from the unsubscribe page, direct them to your preference center so they can adjust email frequency. If you have a robust preference center, they can fine-tune email frequency and request only certain types of emails. Learn about which type of preference center is best for your email program. Provide an option on your unsubscribe page that let’s recipients explain more about why they choose to be removed from your list. This is valuable information that will guide your email marketing strategy beyond just your re-engagement emails. One of the biggest challenges for email marketers is to prove brand value and earn recipients’ trust enough that they open your emails. If you’re not achieving that with a segment of recipients, don’t be hard on yourself. This isn’t necessarily a reflection of your content quality; it might just mean there was a disconnect between when they signed up and what they were really looking for. But if you take the time to solicit feedback and monitor the choices they make on your preference center, you’ve got an eye into how to improve your email program. If you keep your re-engagement campaigns simple, friendly, and consistent, you’ve taken a big step towards improving your email engagement. For more resources on how to optimize your program, check out our A-Z Email Marketing Guide which provides tips and best practices to help you send better email campaigns. 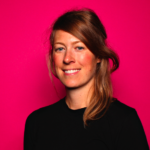 As a senior content marketing manager at SendGrid, Kelsey oversees the SendGrid Delivery blog. Her downtime is dominated by either her mountain bike or skis (depending on current weather forecast)–and mixing up a salty marg afterward.